One of Australia's new senators has said climate change is a global conspiracy created by bankers seeking to establish a worldwide government. Malcolm Roberts won a Queensland Senate seat as member of the anti-immigration One Nation party in recent elections. He says the United Nations is using climate change to lay the foundations for an unelected global government. His previous writing indicates that he believes a shadowy cabal of bankers is controlling world affairs. One Nation is led by Pauline Hanson, who during the 1990s was a controversial figure in Australian politics for her views on immigration and Indigenous Australians. The party won four seats in Australia's Senate during the election, making it the fourth-largest voting bloc in the upper house. The BBC has asked Mr Roberts for an interview and submitted questions to him by email, but has not received a reply. 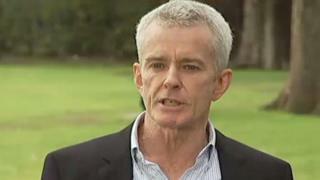 But in recent interviews with the Australian Broadcasting Corp (ABC), Mr Roberts stood by his previous positions. He called for an investigation into Australia's Commonwealth Scientific and Industrial Research Organisation (CSIRO) over its handling of climate change science. When asked if he still believed the UN was trying to impose a worldwide government through climate change policy, Mr Roberts answered: "Definitely". In 2011, Mr Roberts wrote a letter to then Australian Prime Minister Julia Gillard demanding to be exempted from the country's carbon tax. The letter, addressed to "The Woman, Julia-Eileen:Gillard", contained a 28-point affidavit that sought to establish Mr Roberts' exemption from the need to obey the Australian government. He referred to himself as "Malcolm-Ieuan: Roberts., the living soul", and identified himself as the "beneficiary, administrator" for a corporate entity called MALCOLM IEUAN ROBERTS. The punctuation and language is consistent with a style of language used by the so-called sovereign citizen movement, which sees governments as illegitimate and attempts to assert the rights of individuals to ignore laws and taxes. The use of unusual grammar and punctuation by sovereign citizens is intended to establish independence from the government's legal system. However, in a radio interview with the ABC, Mr Roberts denied that he was affiliated with the movement. Mr Roberts also wrote a report in 2013 entitled CSRIOh! : Climate of Deception, Or First Step to Freedom? that detailed his rejection of man-made global warming. "The UN IPCC's unfounded core claim about human CO2 is part of UN Agenda 21 campaign for global governance," the report said. In a 135-page appendix to the report, Mr Roberts wrote in detail about his belief that an international cabal of bankers is exercising enormous influence on world affairs. The report says the US Federal Reserve and Bank of England are privately controlled corporations, and that their owners are seeking to introduce carbon trading into the world economy as a way to generate money and extend their control. It also lists Holocaust denier and conspiracy theorist Eustace Mullins as a primary reference. Mr Roberts has been criticised in the past by prominent Australian climate sceptic Andrew Bolt, who said his theories on banking families "smacks too much of the Jewish world conspiracy theorising I've always loathed". But in the report Mr Roberts writes that those who "falsely smear or imply those raising the topic [of the international banking scam] as anti-Jewish … is an unfounded furphy [an untruth] designed to distract. The reality is that international bankers come from a variety of religions." Mr Roberts told the ABC that his top priorities as a senator were "accountability" for the government and "restoring the constitution", relieving cost-of-living pressures, economic security and security from terrorism.